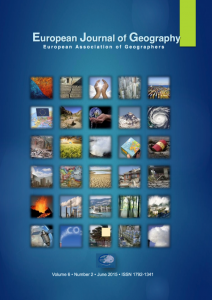 The publication of the European Journal of Geography (EJG) is based on the European Association of Geographers’ goal to make European Geography a worldwide reference and standard. Thus, the scope of the EJG is to publish original and innovative papers that will substantially improve, in a theoretical, conceptual or empirical way the quality of research, learning, teaching and applying geography, as well as in promoting the significance of geography as a discipline. Submissions should are encouraged to have a European dimension.The European Journal of Geography is a peer-reviewed open access journal. Articles and book reviews are published under free licenses, and anyone is allowed to read, download, copy, and distribute them.